We were really there for my husband… to help him find a day hiking backup at Ramsey Outdoor in Succasunna, New Jersey. It’s one of those times when you find something special for yourself too ;). Fairly often I find myself slightly dehydrated and fatigued on longer hikes despite bringing along a bottle of water. No longer do I have to take such conservative little sips hoping to reach the car before running out of water. I believe my new Raven will definitely level the playing field for me. 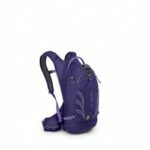 There’s also ample space to carry other little necessities AND I was able to find it in a lovely purple violet (Royal Purple) as well! Because I’m a stickler for cleanliness, I bought a perfect fit Osprey Bite Valve Cover for it. 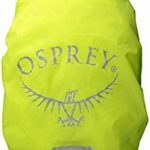 The cover is compatible with other Osprey products like a few of their water containers etc. Recently I purchased a raincover to protect my backpack from inclement weather; its ever so slightly big but it’ll do. Both the bite valve and raincover were purchased from Amazon.com.